Search the web. 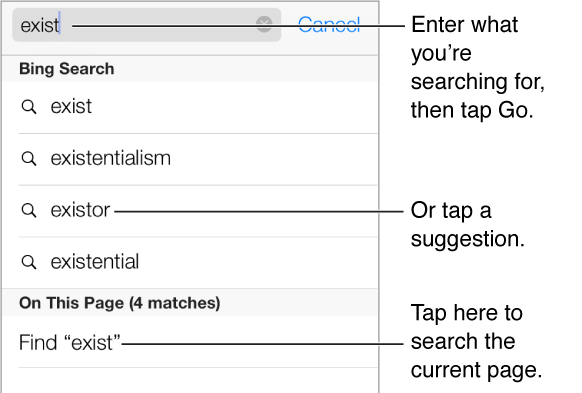 Enter a URL or search term in the search field at the top of the page, then tap a search suggestion, or tap Go on the keyboard to search for exactly what you typed. If you don’t want to see suggested search terms, go to Settings > Safari > Smart Search Field and turn off Search Suggestions. Have your favorites top the list. Select them in Settings > Safari > Favorites. Search the page. Scroll to the bottom of the suggested results list and tap the entry under On This Page. Tap to see the next occurrence on the page. Choose your search tool. Go to Settings > Safari > Search Engine.